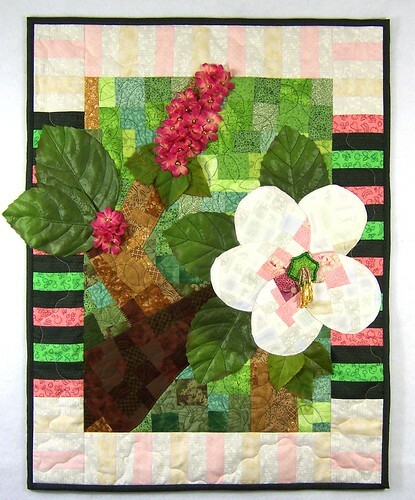 It’s Time to VOTE for your FAVORITE – Project QUILTING Apple Blossoms Challenge – Prizes to be WON! 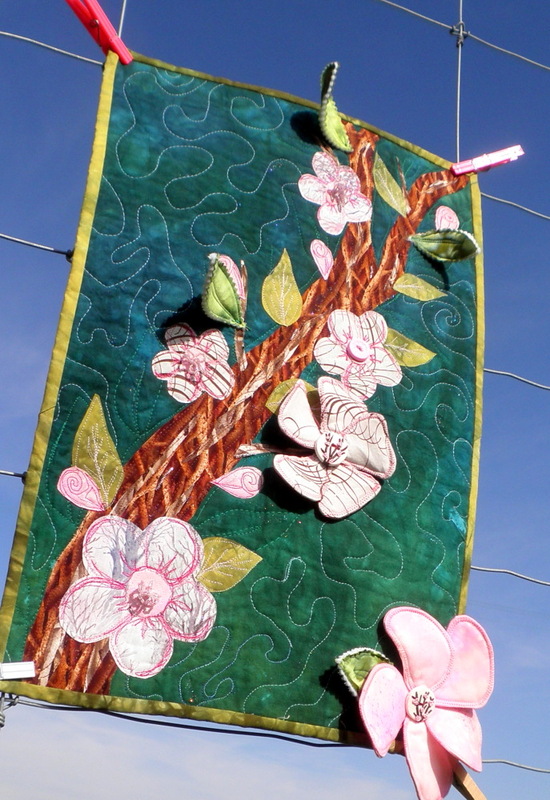 The Story: My entry to Project Quilting Apple Blossom theme! My own design, using Appliqué embellished with vintage buttons and beads. Assorted pieces from my stash, vintage buttons from my gran’s button jar, and beads. I bought the yellow border yesterday to complete it for $6.50, everything else was from my own stash or recent gifts. The Story: Pomme is French for apple … I thought it needed a little je ne sais quois. 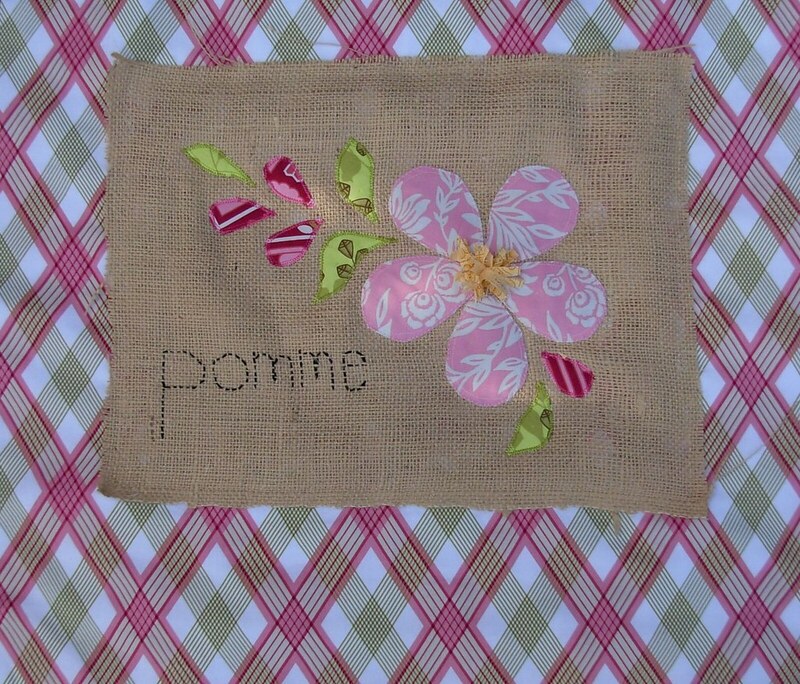 Applique on burlap, mounted on cotton with cotton batting and back. Joel Dewberry fabrics from my stash. Burlap leftover from an upholstery project. This quilt measures 22×19. It will get turned into a tote bag eventually. Thanks for the inspiration and invitation, Kim. This was a fun challenge. 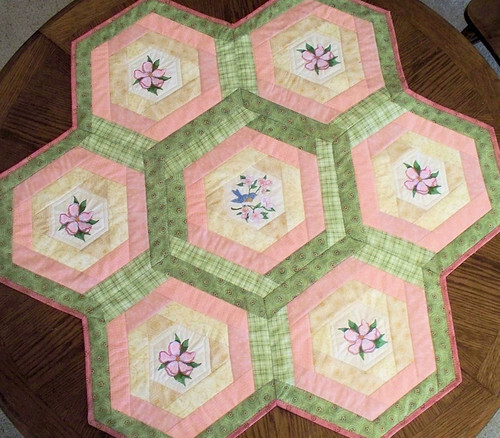 The quilt measures 39 x 15.5 and was created using half square triangles cut on my accuquilt. I machine pieced and machine quilted it with veriegated thread. This started with just a bunch of scraps that I rough-cut into random rectangles and stitched together. 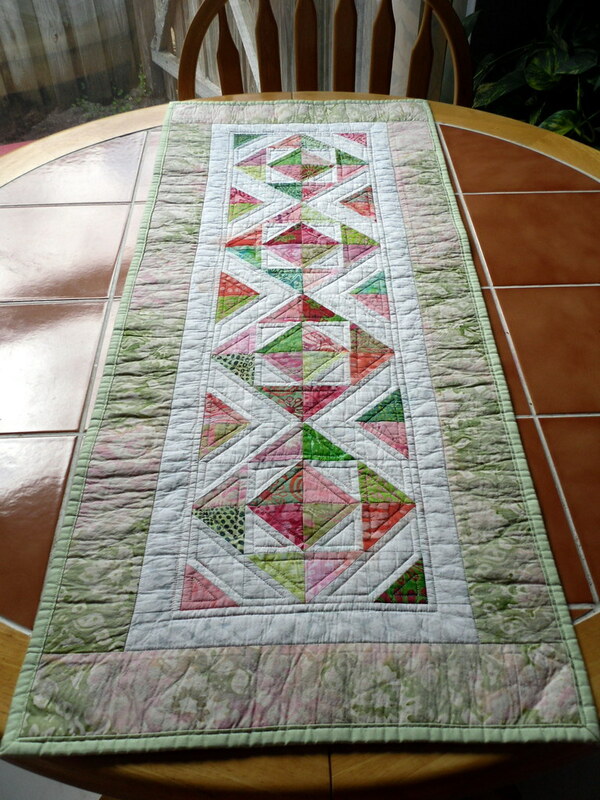 I quilted this with a leaf pattern on the interior & something more free form on the borders. I added leaves that I pulled from a few silk flower arrangements, attached the pink flowers by hand and beaded the centers & stamens. Size is 20″ x 26″. The Story: I decided to go the minimalist route. I started with a fat of dappled blue fabric and stippled it using a thin batting. I then tore strips of brown fabric and thread painted them to give the branches some texture. I used bias tape for the window frame and also thread painted for texture. The flowers are from my stash of silk flowers and are also made from fabric. I embellished the flowers with beads and buttons. All supplies came from my stash except for the bias tape.Total spent: $2.88. This quilt is approx. 20 by 20 inches.This was a really fun project and I look forward to the next one! The Story: I chose a favorite photo from Kim’s beautiful album and interpreted it in appliqué and stitching. I painted the blossoms and leaves a little to add dimension. 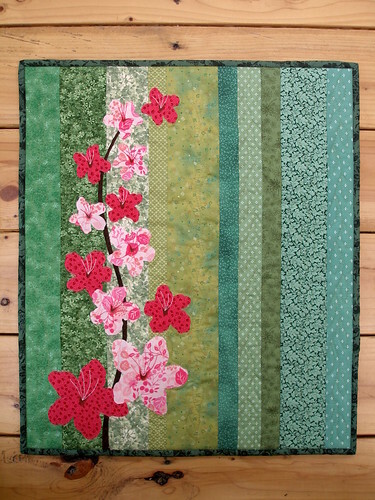 The inner floral border was so pretty and well composed, rather than cutting it into strips, I appliquéd the blossom art right unto it. 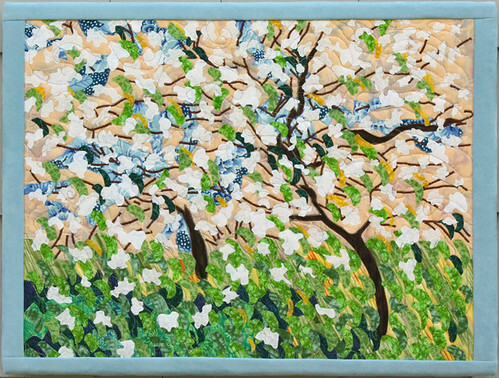 The Story: Inspired by Monet’s Apple Trees in Bloom at Giverny, this art quilt uses hundreds of small cuts of fabric to mimic brushstrokes, to recreate the impressionist style. The twigs & branches were embroidered onto an appliquéd base before adding all of the brushstrokes. I used sky-blue microsuede for the border, and gallery-wrapped it around a stretched canvas frame to hang like a painting. It measures 24″ wide x 18″ high. The Story: Since I’ve been on a roll working on selvage projects this week, I decided to stay in that theme. Plus that a small quilt doesn’t take as much time, and time was short for me! My little quilt measures 14 x 16. 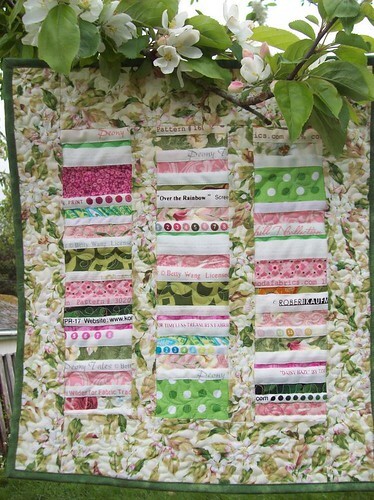 The apple blossom print came from my stash, as well as the selvages! When it came time for the quilting I decided to go small and did a meander and leaf in the print. Well, then the selvages stuck up funny and needed quilting, so I did them in a sampler of machine quilting designs. It was fun! The Story: This cute little baby was inspired by the pictures of Kim’s beautiful little girls in the orchard. It was made entirely from items that I had in my stash. It is also very child friendly. The Story: I knew when this challenge was posted I was going to interpret it literally. I’ve been itching to try my hand at an art quilt for awhile and this was the perfect opportunity. I used this photo: www.flickr.com/photos/33166641@N07/4562837169/ as my inspiration. I started out with a gorgeous piece of hand-dyed fabric that transitions from rich green to a beautiful teal/turquoise. I then sketched out the branch I wanted and raw edge appliquéd it onto the fabric base. I added pieces of the same print of fabric, just in a slightly different in color on top of the main branch to give it a bit more dimension. Then I added leaves and flowers. I also raw edge appliquéd these. 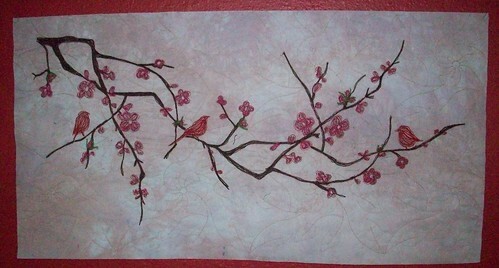 I used different colors of pink thread to ‘paint’ the details into each blossom and bud. I randomly free motion quilted in the remaining area of the ‘sky’. 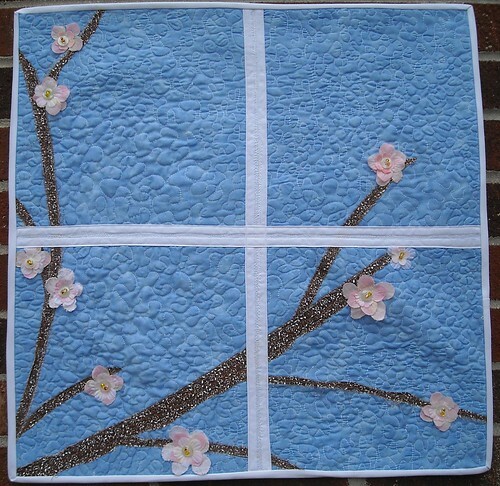 I also wanted to make this a dimensional quilt so I sewed apple blossom petals and then stitched them onto the quilt. The center of the flowers are apple blossom buttons that I purchased this winter from a fellow etsian, TessAnn – how perfect are they?! Three of the flowers have beads as the center. I wanted to create some more dimension for the flower center and the seed beads worked perfectly. When it was all done, I lightly painted some accents with some glitter paint – I felt this piece needed just a touch of sparkle! All the leaves are made from hand-dyes and the flowers and branch are made from commercial prints. Approximate Dimension: 21″ x 13.5″ ***If you want to see ‘close ups’ many of the entrants posted more pictures to the Flickr Group: http://www.flickr.com/groups/1401824@N21/ Feel free to check them out before making your final vote. 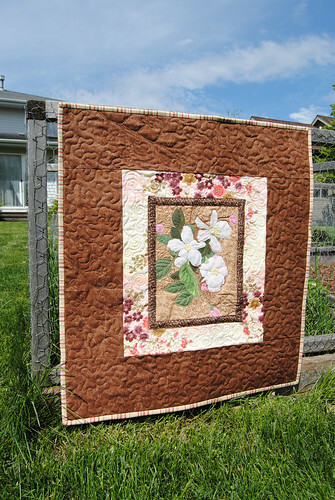 PUBLIC WINNERS: The winner from the Random Generator will receive Diane’s original ‘Prairie Star’ Pattern. FIVE Chances to WIN! Entry 1: Leave a comment on your favorite entry and vote for your favorite on the poll on the upper left hand side of the blog. – ***MUST DO***Optional/Additional Entries Entry 2: Follow my blog. Entry 3: Must tweet this contest with hashtag #PQShoofly (important or I won’t know you did it) Entry 4: Become a Fan of Project QUILTING on Facebook:http://www.facebook.com/ProjectQUILTING Entry 5: add my Project Quilting ‘Grab my Blinkie’ to your blog or blog about my giveaway ***Participants in project quilting ARE allowed to enter in the public poll/contest as well. *** This means you have FIVE chances to win! I need you to write each of these entries as different comments in order to qualify you for all five entries and include your email address. If you don’t include your email address I won’t be able to contact you when you win and I will have to choose a new winner. I will be picking the winner at 7pm on Friday, May 7th. Also – there’s been a small modification to Project QUILTING: http://kimlapacek.com/2010/05/project-quilting-season-one.html and I would love your feedback! Very hard to choose but I'm going with Quilties on this on. My favorite (aside from my own which grew on me) is PennyFabricArts. It looks like a painting! 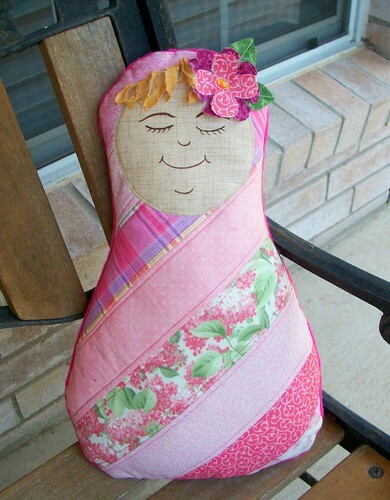 I chose the doll by quilting frenzy, because she really thought outside the box and came up with something really cute! I voted but I don't want to say for who since they were all so wonderful and it was a hard choice! I'm already a blog follower and a facebook fan. I voted for Penny Fabric Art! It was a hard choice, tho…everyone should be a winner! I voted for Karen's Crafty World – I love the view outside the window! Nice texture too. I am a follower on your blog, and love to see these great works! And finally, I have your blinky on my blog. I will bring it to the forefront when I post this week. It was such a hard decision….I finally decided on QuiltSewPeiceful. They are all beautiful. Great job, ladies. I have four favorites – stop accepting so many beautiful entries, hahaha. I blogged about Project Quilting, and included your "blinkie"
I'm also already a facebook fan and follow your blog. quilting diva! Love the batiks she used. I already follow your blog (RSS feed on google), and I think I've fanned you on FB as well… but I voted. It was a really difficult decision; so many of these entries are just fabulous! Everyone did a great job of interpreting this challenge and I had so much fun. I hope to be able to enter more challenges as they come up. I blogged about this, added ur blinkie and am following on FB! LOVE THIS!!! !